In times of chaos, we pray for peace. If my kids are acting wild, I will whisper ‘shalom’ in prayer over them until they stop (doesn’t always work). If I’m feeling anxious or overwhelmed (which is a frequent occurrence some days) I’ll pray for God’s peace to fill me up. If I read a news article about what’s going on in the world today, I’ll pray for peace for the broken state of our world. It’s a term so frequently used and so desperately needed that the depth of its true meaning can often become lost. What if I told you that you were the one in control of your emotions? It’s all in your head. Or atleast made in the image of God, you are intended to be able to control your thoughts and emotions. But sin was chosen, the fall of man infected the generations, and now we are creatures of feelings enslaved to our broken hearts and shattered minds. We’ve forgotten our true identity. The peace of God became necessary for us to start seeing our true heritage as children of God. God enstilled 5 levitcal offerings, or sacrifices, designed to atone for sin and bring the Israelites back into relationship with Him. But for this blog I just want to focus on one.. The peace offering was a voluntary gift given to God from man to establish a peace alliance, a friendship. It had to be preformed continually, perpetually for the peace to remain, for the friendship with God to remain (Leviticus 3:17). This offering was a restoration of communion with God. It was the only offering or sacrifice that consisted of a meal eaten and shared with the Offerer, the priests and God. This was the beginning of modern Christian’s communion (Luke 22:29): a sacrifice given, then unleavened bread and wine taken in thanksgiving and fellowship with God. But this was merely a shadow of what Jesus was going to provide. Being the Prince of peace, Jesus was the living peace offering. But this time around, the offering was from God to man. The alliance was extended from Heaven to earth. 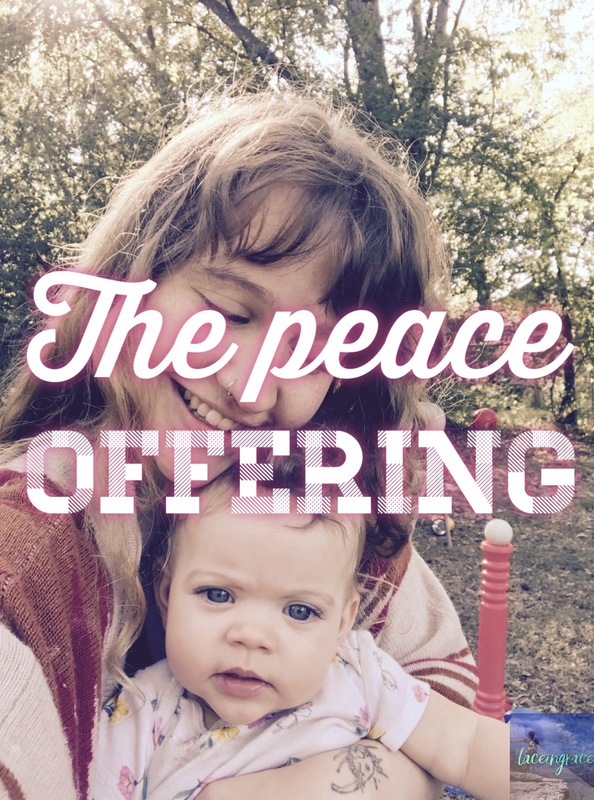 The challenge no longer existed in the works it took to kill one’s innocent livestock or in the financial loss the animal would’ve provided the family..the challenge is now in perpetually or constantly accepting this peace offered from God. Jesus is the final and ultimate peace offering establishing eternal fellowship with man and God. Peace is a gift given voluntarily to us. Peace is constantly available, and constantly accessible. The work isn’t in constantly asking for God to give us peace or through sacrificial means, the peace is already ours. No, instead, the work is in training our minds to always accept the peace that God has freely planted within us through His Holy Spirit. How do we access this peace when the chaos becomes too loud? Pray! Constantly pray to God. Praise! Constantly praise God. Even when life doesn’t feel praiseworthy. Speak both prayers and praises out loud so you can hear the requests and begin to believe that they will come into action. Give up the baggage, give up the negativity, and give up the overwhelming chaos. The burden was never meant to be yours. Throw it all down at the foot of the cross where the final and ultimate sacrifice was given through Jesus Christ! Let it go. As a woman who has lived a large part of her life battling mental health disorders, from suicidal thoughts (and attempts), to eating disorders, to severe anxiety, I was a walking billboard for mental instability. I was living my life as a daily sacrifice trying to establish a peace that can only come from God. And that’s why the peace was always fleeting, always absent. The medication didn’t fix me- it was only temporary until I took the next dose..and the next. The alcohol and drugs didn’t fix me. The toxic relationships didn’t last. No. Only the peace of God provided through acceptance of Jesus has transformed my mind and, in return, my life. The anxiety is less intense and short-lived. The depression is non-existent. I see myself in God’s image now. I’m not perfect, but I have the transforming mind of Christ. If I can change, you can change. It sounds hard and sometimes it feels like it, but I can’t exactly trust my feelings, now can I? It’s a daily acceptance of peace. A daily choice of a renewed mind through Christ. A daily acceptance of God’s ultimate offering to us- Jesus. Speak peace over the chaos with the authority given to you through the Prince of all peace. Believe peace is here even when it doesn’t look like it with your eyes or sound like it in your head. You will transform through accepting God’s gift of peace through Jesus. I am in no way a doctor or psychologist. So please don’t take my word for healing your own mental health issues. Read the Word, the Bible, for yourself and listen to whatever God tells you through it. I’m merely sharing my found healing through Christ. Read and see for yourself!